In this first book from an openly lesbian and celibate Catholic, widely published writer and blogger Eve Tushnet recounts her spiritual and intellectual journey from atheism to Catholicism and shows how gay Catholics can love and be loved while following Church teaching. 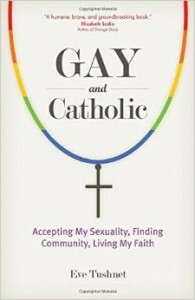 Eve says: Basically this is a partial guide to finding your calling in life if you are gay and Christian. It's about the many paths of devoted love which are open to you within the Christian sexual ethic. It's also a challenge to the churches to expand our understanding of love and family. You can get a sense of my approach here and here. You can also read my interview about the book with America magazine.